Somewhere along the line, the sisterhood seems to have lost its way a bit. Sadly, you now hear as many stories of women complaining/competing/bitching about other women as you hear supportive stories. And it seems often, the “bullies” at work can turn out to be women. It’s important to say upfront that there are many, many women in the workforce, at every layer of the organization who are supportive of the development and success of other women. Indeed, they view it as a measure of their success, if other women (and men) succeed on their watch. If you are not in this situation though, it can be very unpleasant to feel that there is another woman competing against you. And female competition seems to be somewhat insidious rather than the more overt male competition. 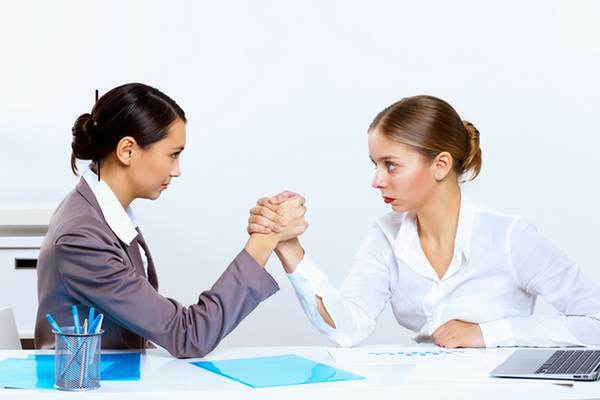 So, some tips to help deal with female competitiveness at work. Try and understand where the competition is coming from. Taking a moment to understand the situation from another’s perspective can be valuable. If you can understand what is driving someone to behave in the way that they do, then you can either decide to address it or ignore it. Of course, there will be times where the “why” is really not obvious. People are complex, after all. Remember, you don’t need to engage with the drama. If the other person wants to compete with you and you can live with their antics, ignore it, and just keep doing what you are doing. Perhaps, even take it as a compliment and use it to drive you to do even better. Using the drama as a way of garnering support for your cause by recruiting supporters to “your camp” will ultimately reflect badly on your brand as well as hers. Don’t do it! Take a moment to see if it’s actually your perception of the situation. Sometimes, it’s actually someone trying to push you to do better, but doing so in a very imperfect way. It’s hard to accurately see through our biased lens, so sometimes speaking to a trusted advisor outside of the workplace or using your Employee Assistance Programme can give you a less biased view of her behaviours. Remember, that once we start to believe that someone is acting in a particular way, we can frame all their behaviours to support and reinforce that belief. If however, someone’s competition with you is stopping you from doing your best in your role, then you’ll need to act. If you can, speak with the person concerned directly. Be assertive not aggressive. Use “I” and explain what you have observed and what impact it is having on your ability to do your job. Ask if you can work together to improve the situation, or if she needs something from you to change the situation. (Remember, situations like this are never cut and dry, and sometimes you may be inadvertently contributing or exacerbating the situation. Be prepared to “own” your own contribution to the situation). Critically, if the competitiveness is in any way bullying in nature – get immediate confidential advice from your Manager, HR or your EAP on what you can do to manage the situation. Don’t let it continue unabated. It’s true, there are some horror stories of women competing against women. And if you’re in it, it can make coming to work most unpleasant. But every day there are also stories of how women are holding up other women’s success and celebrating that success. I am energetic and innovative. I am business focused, pragmatic and have a 'can do' approach. I love working with businesses who want to make a difference, who want to change and improve and who want to see what's truly possible. I do this via my two businesses, Tammy Tansley Consulting and Help Me HR. Since 2011, I have been asked to judge the Telstra Business Womens' Awards and in 2015 also judged the Telstra Business Awards. I am also involved in a number of charities and mentoring progammes in WA and nationally. Giving back when you can is an important part of what I believe in and who I am.I am a proud board member of Bridging the Gap. I am energetic and innovative. I am business focused, pragmatic and have a 'can do' approach. I love working with businesses who want to make a difference, who want to change and improve and who want to see what's truly possible. I do this via my two businesses, Tammy Tansley Consulting and Help Me HR. Since 2011, I have been asked to judge the Telstra Business Womens' Awards and in 2015 also judged the Telstra Business Awards. I am also involved in a number of charities and mentoring progammes in WA and nationally. Giving back when you can is an important part of what I believe in and who I am. I am a proud board member of Bridging the Gap. I am a mother to two beautiful little girls, a founding member of the Pets of Older Persons programme (POOPs WA) and a runner training for my first half marathon. I have travelled and lived all over the world, but am very happy to call Perth home. I love to write, and to read.. a lot! And I love good food.